by marc / Monday, 03 September 2018 / Blog Category: Downtown - Old Vegas and Everything Vegas. The improvements to downtown Las Vegas are continuing for locals and tourists alike. A new gateway to Las Vegas recently opened, the Fremont Street Experience is upgrading their Viva Vision screen, and the city is in the middle of a major highway improvement that will make accessing downtown Las Vegas easier for drivers. 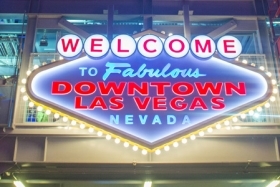 A “Welcome To Fabulous Downtown Las Vegas” sign on Las Vegas Boulevard used to welcome those visiting downtown from the Vegas Strip. That sign was destroyed by a car accident in 2016 and has been replaced with a new sign and display being called the gateway to downtown Las Vegas. The new City Of Las Vegas sign is flanked by two 26 foot tall showgirls. There are a roulette wheel and stacks of chips in front of the sign and showgirls to help fill out the new space. The Gateway looks nice during the day but the most instagramable shots might come at night when it’s all lit up. The gateway to downtown Las Vegas is just north of the Stratosphere. The casino offers free parking for casino-hotel guests and will welcome anyone that needs to park on the way to visit the sign. This major highway upgrade has been a headache for many drivers in Las Vegas over the past couple of years. Project Neon is massive. In fact, this is the largest public works project in Nevada history. When Project Neon is finished in the summer of 2019 the city will have widened Interstate 15 by 3.7 miles between Sahara Avenue and the “Spaghetti Bowl” interchange in downtown Las Vegas. The good news is that this will eventually make to and around downtown Las Vegas easier for drivers. The bad news is that there is still almost a year of construction to go. You can find more information about Project Neon here. In February, the Fremont Street Experience will begin to upgrade the Viva Vision screens above the mall of casinos. The new screens will be seven times brighter and have four times the resolution than the existing canopy. The new screens at the Fremont Street Experience will offer two major improvements. The screens will make everything shown better looking and easier to see. The upgrade will also allow the Fremont Street Experience to use the screens 24/7 if they want. Installation of the screens will take place almost the entire year. They expect to unveil the new Viva Vision on December 31, 2019.